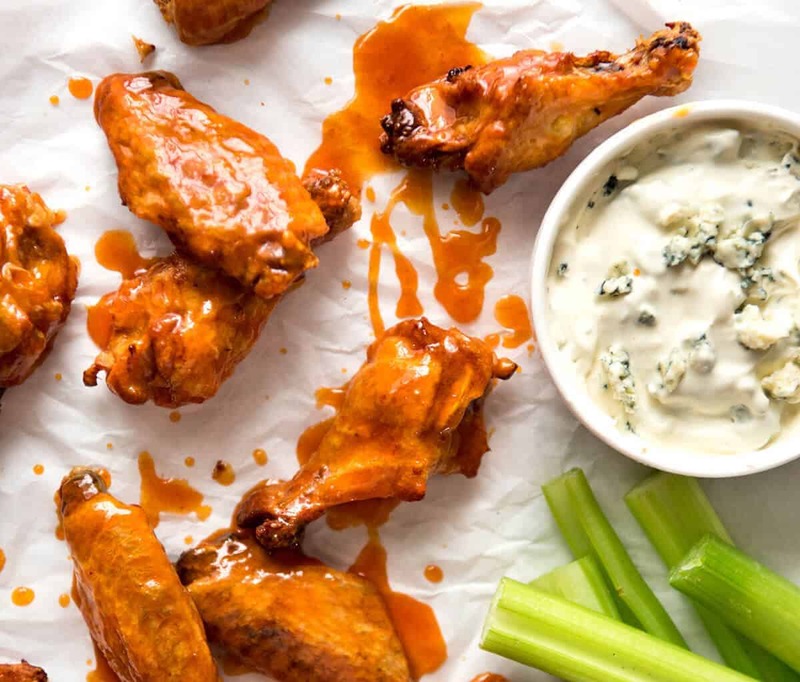 No false promises here – these are SERIOUSLY CRISPY Oven Baked Buffalo Wings! You can’t see how crispy the skin is when I’ve smothered them in that glorious Buffalo Sauce so here’s a photo of them plain, straight out of the oven. And if you have 90 seconds, watch the recipe video below the recipe so you can hear how crispy they are! 2. baking the wings at a low temperature first, which melts the fat under the skin (which also means less calories! ), then cranking it right up to crisp up the skin in a hot oven. 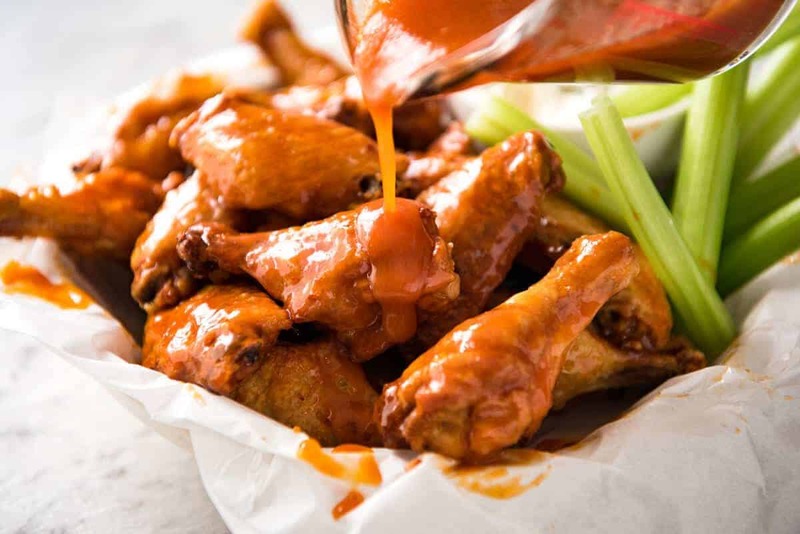 Then toss them in Buffalo Sauce…..
…..and serve with a side of Blue Cheese Dip. Oh – and celery. 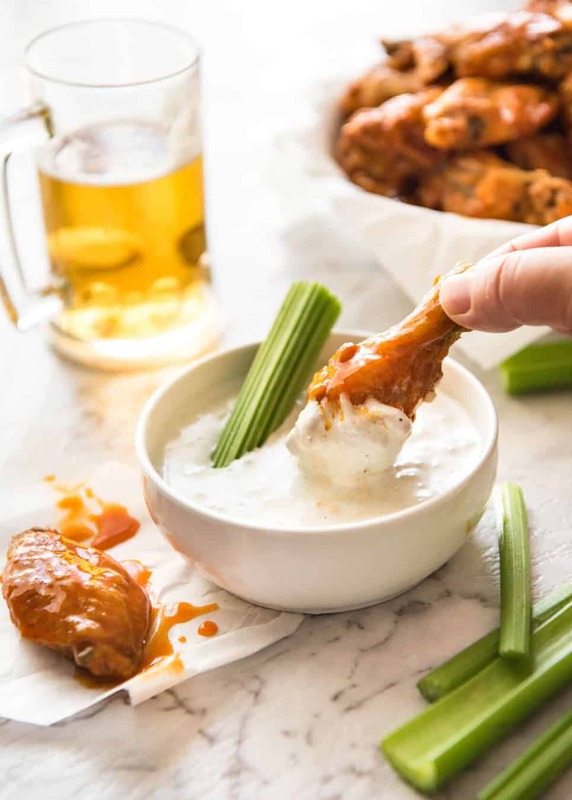 Crispy wings, spicy buttery Buffalo Sauce, the earthy creamy blue cheese dip and fresh crunchy celery is a magical combination. I don’t know who discovered it, but they deserve a Nobel Prize. I remember the first time I tried it, I squinted at the celery sticks and thought, “who would bother with them?”. But they work! It’s like the perfect way to reboot your taste buds in between each wing!! 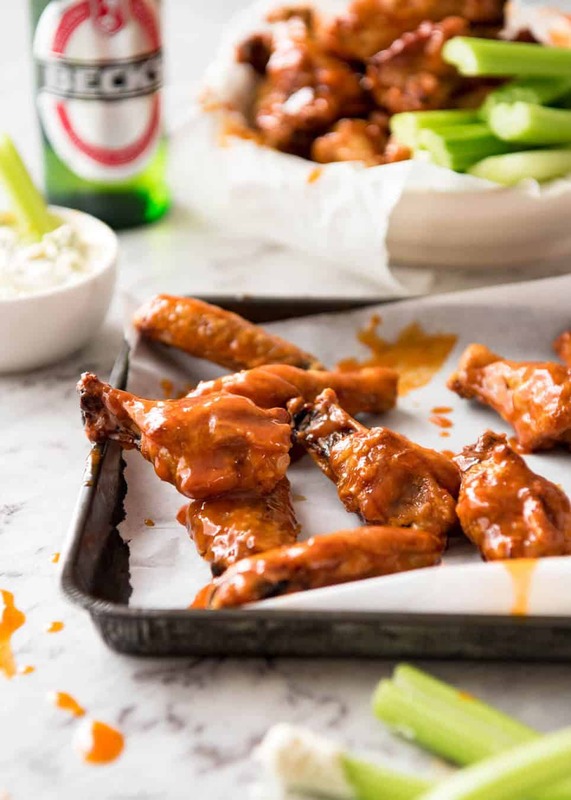 I first posted these Truly Crispy Oven Baked Buffalo Wings back in June 2015 when I launched my Chicken Wings Cookbook (yes I’m that obsessed with wings!). In the time since then, I’ve learned how to shoot recipe videos which is why I’m reposting this recipe. And while I was at it, I did some fresh new photos too. Truly Crispy Oven Baked Buffalo Wings recipe video! PS PUMP UP THE VOLUME so you can hear how crispy they are!! Recipe video above. 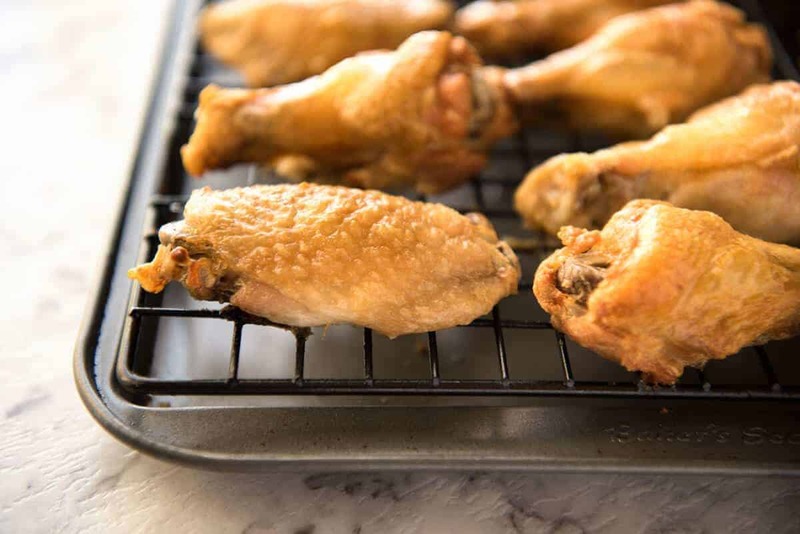 This recipe uses a technique discovered by Cook’s Illustrated to make chicken wings in the oven that come out so crispy that it’s hard to believe they aren’t deep fried. Tossed in a classic hot sauce and served with a side of blue cheese dip and celery sticks and you have one of the most genius food combinations this world has ever seen! Comprehensive FAQ is available in the original Crispy Baked Wings (scroll below recipe). Lay the wings on a rack on a rimmed baking tray and let them dry in the fridge overnight. Alternatively, pat them dry with paper towels. Preheat the oven to 250F / 120C (all oven types – standard/convection/fan). Put one oven shelf in the lower quarter of the oven and one in the top quarter. 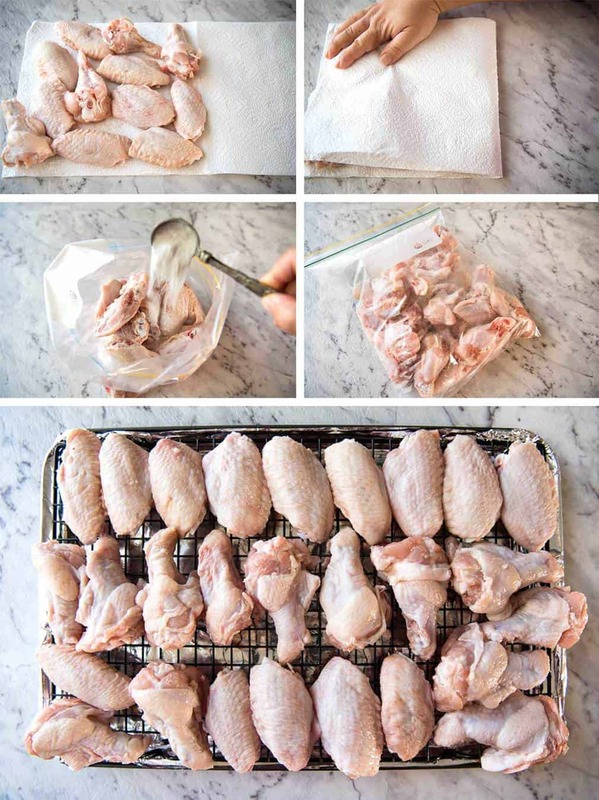 Place the wings in a large ziplock bag. Add the baking powder and salt. Shake the bag to coat the wings evenly. Line the tray with foil. Spray the rack on the baking tray with oil. Place the wings skin side up on the rack (ok if snug, they shrink). Bake on the lower shelf in the oven for 30 minutes. Then move the tray up to the higher shelf and turn the oven up to 425F / 220C. Bake for a further 40 to 50 minutes, rotating the tray halfway through. The wings do not need to be turned over. The wings are ready when they are dark golden brown and the skin is very crispy. Toss with Hot Sauce and serve immediately with Blue Cheese Dip and celery sticks. They can be served plain, with a dipping sauce or tossed in sauce. Whisk together the Sauce ingredients. Keep warm or reheat just prior to using. Mash the blue cheese with sour cream until smooth (or to your taste). Add remaining ingredients and mix well until combined, using milk to get it to the consistency you want. Store in the fridge until required. Remove from the fridge 15 minutes before serving. 1. 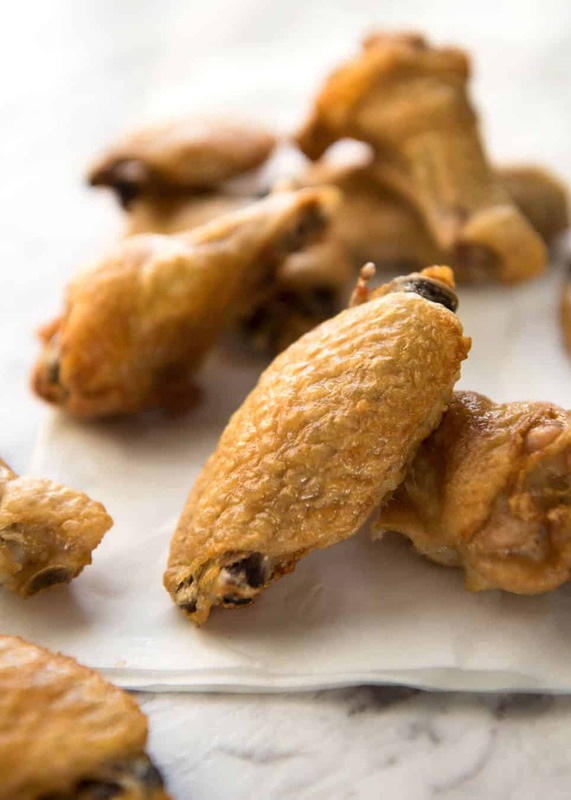 Wings – While this recipe can be used for whole chicken wings, I prefer to cut them into wingettes and drumettes to make them easier to eat. See below for how to cut wings. You will need 2.15kg / 4.3 lb of whole wings to make 2kg/4lb of wingettes and drumettes, after taking into account the wing tips which are discarded. 2. Baking powder – Use aluminium free baking powder, if you can find it, the flavour is neutral. If you can’t find it, it’s totally fine – just be sure to toss the wings well to coat evenly, you do not want thick patches of the baking powder anywhere. 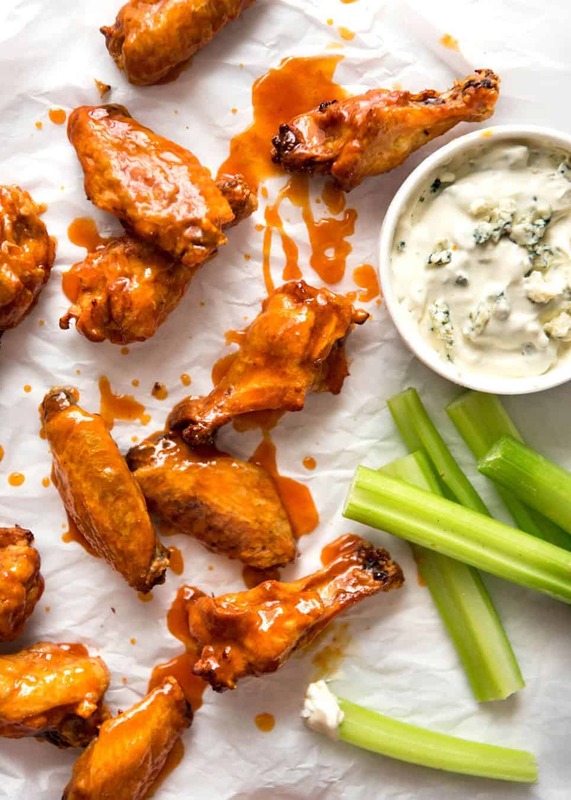 Baking powder is the secret to outrageously crispy baked wings, discovered by Cooks’ Illustrated / America’s Test Kitchen. DO NOT mistake with baking soda /bi-carbonate soda – if you use baking soda accidentally, it is inedible. 3. Franks Hot Sauce – If you are in Australia, you can find Frank’s Hot Sauce at Coles and Woolworths in the section where tomato sauce, tabasco etc are. It costs around the same as other hot sauces. If you can’t find Franks, then any other hot sauce will do just fine. Even sriracha works – just add 1 tsp of sugar. * Salt – only a small amount is required, it’s a phenomenon I can’t explain but this small amount perfectly seasons 2kg/4lb of wings using this baking method. * These shrink when baked because the fat under the skin renders out (melts) which is how these become super crisp. So they can be snug on the rack. * They are JUICY not dry, despite the long cook time. This is because the first bake at the lower temp barely cooks them, it only melts the fat. * These bake to a golden brown, not a deep golden brown. You will know they are done because the skin will be lovely and crispy. 5. 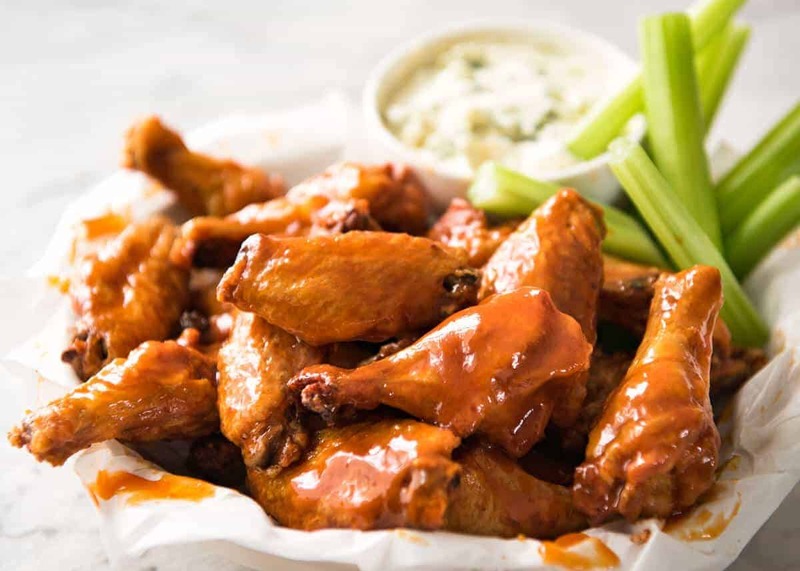 Source: The recipe for the wings is from Cook’s Illustrated “Meats Book” cookbook. The sauce recipe is my own. 6. To reheat: Allow to cool, then cover and refrigerate – do not coat with sauce. The skin will wrinkle and soften. Preheat oven to 200C/390F. Spread wings out on tray, skin side up, and bake for 5 to 8 minutes or until the skin puffs up so the wrinkles smooth out and becomes crisp again. 7. Make Ahead: These stay crispy for as long as the wings are warm, so around 20 – 30 minutes. The skin stays crispy for around 10 – 15 minutes after tossing in the sauce, then after that they start to soften but not go soggy, up to around 30 minutes. If you reheat after tossing in sauce, they go soggy. 8. Comprehensive FAQ is available in the original Truly Crispy Oven Baked Wings. 8. Oven Baked Buffalo Wings nutrition for just plain crispy wings (419 cal) and including the hot sauce (476 cal), both assuming 8 servings. Note that the wings have been adjusted to reflect the amount of fat that is rendered out (I measured the fat I poured off the tray ). Here in Australia, chicken wings are usually sold whole rather than cut into drumettes and wingettes. While this recipe can be used for whole chicken wings, I prefer to cut them to make them easier to eat. 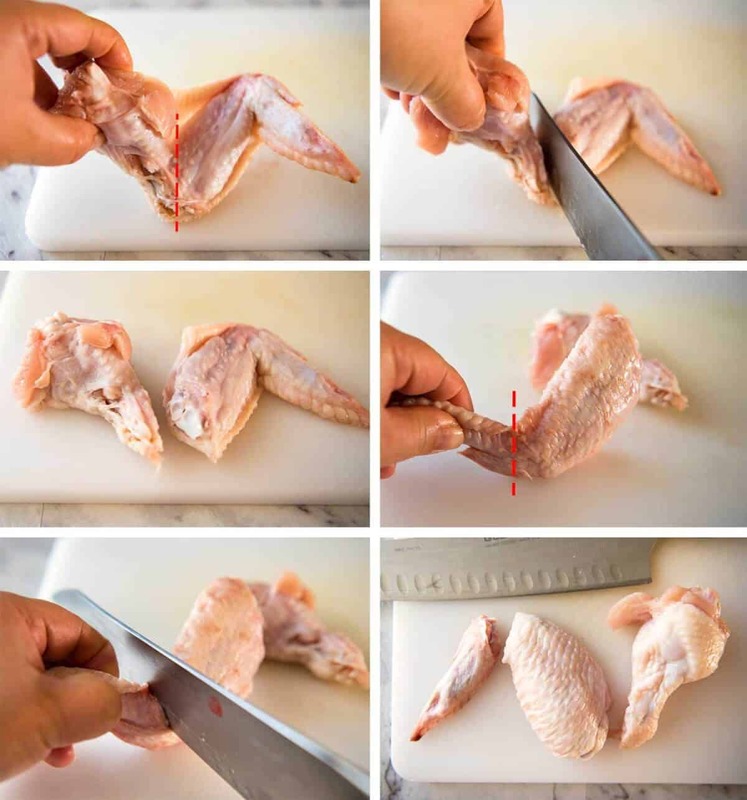 Here is how I cut chicken wings. The knife just glides through the joints – you won’t need to use any force or bang the knife with your hand to cut it through. Once you get the hang of it, it’s really fast. It takes me around 2 – 3 minutes to cut up 2 kg / 4 lb of wings (not showing off, just saying!). You’re done! 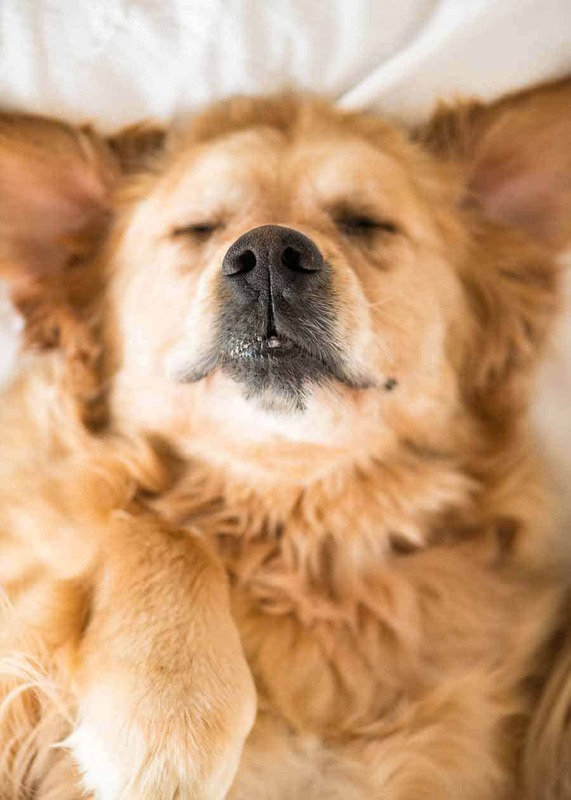 Discard the wing tip – save them to make stock (or give to your pup!). This is what a Food Coma looks like. Because yes, I’m that obsessed with wings, I made an entire cookbook of recipes solely dedicated to wings. Crispy, crunchy, sticky, glazed, breaded/crumbed – all my favourites are in here along with essential dipping sauces. Find out more here! 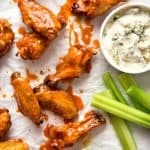 The post Truly Crispy Baked Buffalo Wings appeared first on RecipeTin Eats.